Sometimes it really feels like there aren't enough hours in the day. After a long commute home, Netflix & nap time are way more appealing than dirty dishes & doing laundry. I always tell myself I have enough time to do everything tomorrow - then tomorrow comes & I have more to do in less time! After settling into my new work schedule, I found myself putting off chores using the same seemingly reasonable excuse: "There's not enough time to do it!" Turns out I was both wrong & right. 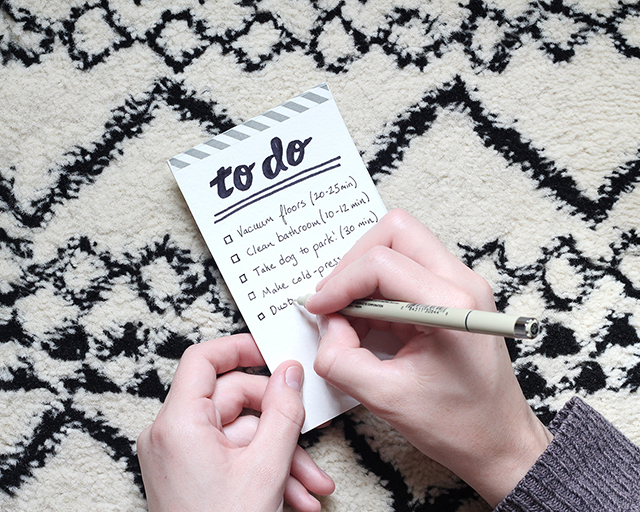 While to-do lists & schedules are essential to effective time management, it's also important to know how long it's going to take you to do something on your checklist. Over the past few weeks I've been timing how long it takes me to do the everyday things - vacuuming, doing laundry, emptying the litter box, etc. The results were super helpful! If you're trying to get more done in your day, clock your chores. Record the time it takes you to do the daily or weekly essentials, like taking the dog on a walk or cleaning the bathroom. Grab your phone & turn on the stopwatch before you start to do something. Don't turn it on with the first spritz of bleach - start the timer the moment you decide do to clean the bathroom. That way you're counting the time it takes to get your cleaning supplies, move your laundry hamper to the washer, etc. When the task it completely finished, turn the timer off & write down the time it took. I added a couple extra minutes to each task to account for human error. You might be surprised at how little time it takes to get things done! Now that you know how long it takes to get stuff done, you can schedule your days accordingly. While some tasks were much faster than I thought (why does time go the slowest when you're doing dishes? ), others took much more time than I had imagined (i.e. doing laundry). Knowing this I can make a to-do list without overwhelming myself. For example, if I have grocery shopping to do one day, I know I can't also do laundry & expect to go to bed at a reasonable hour. It's a lot less stressful knowing what you're capable of in a day. Don't hold yourself back by making it difficult to get tasks done. Make your tool accessible! I noticed that emptying the kitty's litter box takes more time than I had thought, but that a large hunk of time was being spent preparing! I was wasting time finding everything I needed to get started. The trash bags were under the sink, the litter box in the bathroom, & the litter in the closet on the other side of the house! 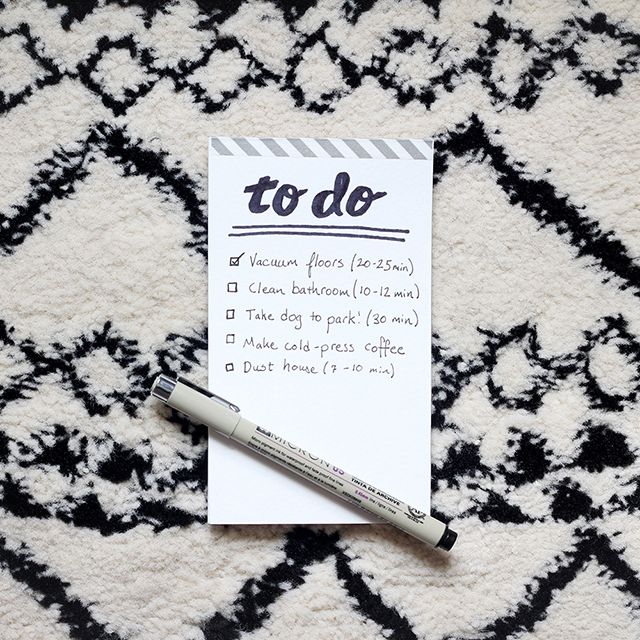 Do yourself a favor & take note of the tools you need to do each chore. If you're primarily using your rubber gloves for cleaning the bathroom, why not keep them in the bathroom? If you hang up your clothes in the closet after they've been ironed, why not keep your ironing board nearby? Arrange things in your home to help you out as you clean. While I don't plan out every moment of every day, it's nice having a rough idea in my head of how long things take to get done. Plus it pretty much eliminates all support behind my excuse of "there's not enough time!" Yeah, there is. There are no excuses when dishes only take 5-6 minutes. Happy cleaning! P.S. Organize with this DIY.